Most Sonic drive-thrus are more than willing to give you one or two drink caddies for free, so I thought this would be an inexpensive way to put a gift together. I added a soda, some sweet treats and and apple (of course) to finish it off. I used My Pink Stamper School Days to make my own "background" paper and I LOVE the way it turned out!! I used My Pink Stamper Yummy-licious for the "to/from" tag. The apple is from the Cricut Preserves cartridge, and the "for my teacher" is from my fave font, Don Juan. Very cute, I love the idea of the drink holders clever! This is great! The background you created looks terrific---gotta love Sonic, too!! Such a great gift caddy. I am sure someone will love it. Outstanding caddy! You did a wonderful job on the caddy and I know the teacher is going to be so happy to receive it! This came out super. Looks like a picnic. This turned out so cute. Love how you decorated and embellished. Have a great day and thanks for being a Teacher. Truly adorable. 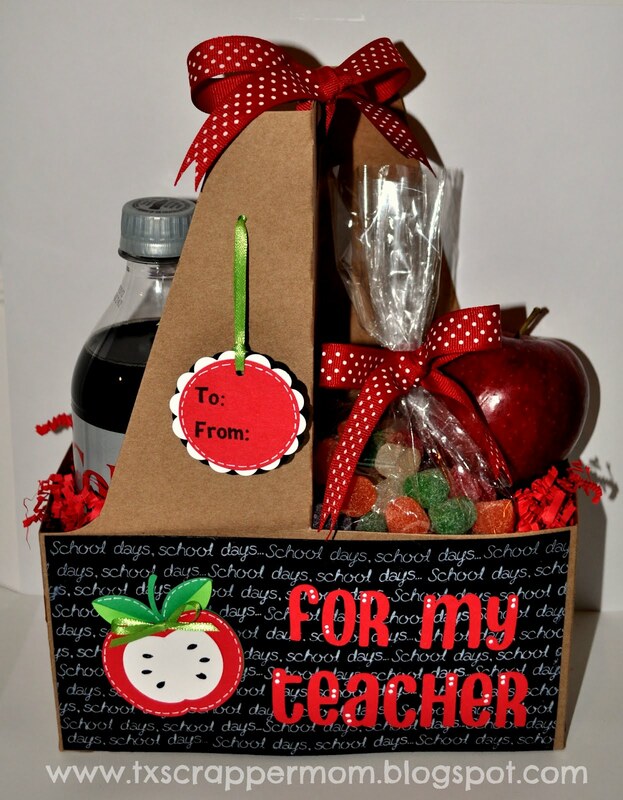 I am thinking about doing this for some Pre-K teachers. Thanks for sharing. Saw this on MPS the other day...so creative and I'd love it as a teacher gift.